Meet Arminius Vámbéry, a Hungarian-born linguist and scholar who, in the mid 19th century, travelled through Central Asia and Persia dressed as a dervish. 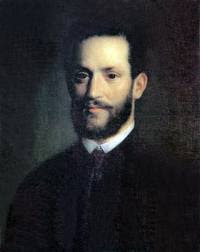 Born into a poor Jewish family, he revealed an astonishing aptitude for languages and, at 20, moved to Constantinople. There he made his living by teaching languages and reciting Turkish and Persian poetry in coffee houses. In 1858 he published the first German-Turkish dictionary; he claims to have learnt 20 Ottoman languages and dialects. Taking the name Resht Effendi, he disguised himself as a Muslim dervish and set out for Central Asia, travelling with a band of other dervishes. 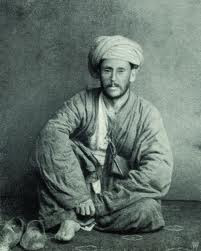 He arrived in Khiva, via Shiraz, in 1863 where he managed to keep up appearances during an interview with the Khan. He continued on to Bukhara and Samarkand and then returned to Constantinople via Herat. The journey would have been extremely dangerous as well as arduous: Vámbéry was lame in one leg. To maintain his disguise he could not openly record his experiences, and scribbled in lead pencil on various scraps of paper which he secreted in the wadding of his beggar's dress for months on end. He returned to Europe in 1864 and published the account of his journey Travels in Central Asia, which catapulted him to international fame. He visited London, where, given the high interest in Central Asia, he was feted as a celebrity. His writing provides one of the last glimpses of the Central Asian khanates as they stood on the eve of their Russification. He returned to Hungary in 1865 as professor of Oriental languages at the University of Pest, where he continued his scholarly, linguistic research. Vámbéry died in 1913 aged 81. Remarkably, in 2005, the British National Archives made files publicly accessible: it was revealed that Vámbéry had been employed by the British Foreign Office as an agent and spy, whose task it was to combat Russian attempts at gaining ground in Central Asia and threatening the British position on the Indian sub-continent. Bram Stoker met Vámbéry twice and some biographers believe that Vámbéry acted as his consultant on Transylvanian culture and introduced him to the Dracula legend. The character of Professor Van Helsing in Stoker's novel, Dracula, is sometimes said to be based on him, though there is no solid evidence. You can download Vámbéry's 1889 autobiography Arminius Vámbéry: his Life and Adventures and also read the entertaining Travels in Central Asia as a free e-book.